“O Christmas Tree, O Christmas Tree, How Lovely are your Branches”. I love that song. I also love Christmas trees. I have been known to have as many as 12 trees with lights and decorations, but this year I only put up four. It’s just so much work! As I get older it is less important to make my home look like a page out of Better Homes and Gardens (for you young people, that used to be THE magazine to inspire your home decorating). Oh well I digress from sharing little quilts with you – sorry. 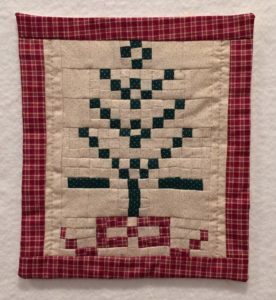 This week I want to show you a few of my favorite little Christmas Tree quilts. This first one was made for me by my friend Linda R. It is such a cute wonky tree with a wooden star button on top. I love hanging it up in December. Another of my favorites is one that I picked up at a craft sale years ago. It is not signed or dated by the maker, but it is an adorable 7.5” x 8.5” little quilt made with lots of little squares. It kind of reminds me of a “Charlie Brown” tree – no ornaments and it is rather primitive but still retains a special charm. The last tree (13” x 15.75”) is one that I made in 2011. 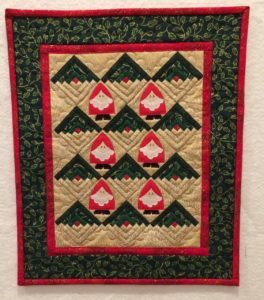 I can’t help myself, and I make at least one new little Christmas quilt each year. It’s amazing how many I have collected but I am also happy when they have dates on the back. Someday if my granddaughter Freya inherits them she will know when Grandma created each one. These cute trees (made of log cabin blocks) are offset with charming Santas. This is not my design and I am sorry I do not remember the name of the book with this pattern. I guess that is another thing I should put on my labels. It would be nice to give credit to the creator. I am also sharing a picture of “Twinkle Twinkle Many Stars” (63″ x 63″) to remind you that you still have time to sign up for the 2018 Follow Along. You can make this quilt in 5 months! I would love to have you join me as we make this quilt for the new year. You can sign up at Wooden Spools web site. Today is the 7th day of Hannukah and only 8 days from Christmas. Lots to celebrate! ← Y is for Year-End Closeouts!